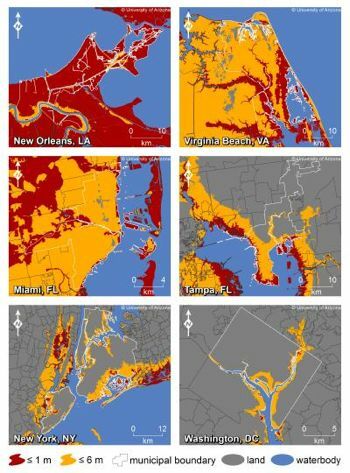 Over 40 million people in the coastal United States–including New York City and D.C.–could be impacted by rising sea levels in the coming decades. The world will only get wetter. That’s the somber conclusion of a new study done by the University of Arizona. Miami, New York City, and Washington D.C. are among 180 coastal cities that are all at risk of facing sea level rises of 20 feet by the year 2100, causing floods and erosion and impacting over 40 million people, according to the first large-scale study that looked at sea level rises for the entire continental United States. Miami and New Orleans alone could lose over 10% of their land by 2100. The University of Arizona research points to global warming trends and effects in the United States that impact coastal areas inhabited by 50,000 or more people and not just those who live on or near the beach. The researchers point out that damage from sea-level rises also infiltrates through creeks, channels, adjacent low-lying areas, and inlets, which means that beach-bums are not the only ones who should be concerned. “Our work should help people plan with more certainty and to make decisions about what level of sea-level rise, and by implication, what level of global warming, is acceptable to their communities and neighbors,” said co-author Jonathan T. Overpeck. The researchers also found that global temperature averages will be 8 degrees warmer than they currently are by the year 2100. “That amount of warming will likely lock us into at least 4 to 6 meters of sea-level rise in subsequent centuries, because parts of the Greenland and Antarctic ice sheets will slowly melt away like a block of ice on the sidewalk in the summertime,” said lead researcher, Jeremy L. Weiss. And sea levels are to continue to rise at an average rate of 3 feet per century–a rate expected to be higher in certain high-risk areas–which the researchers hope will compel policy makers to plan ahead for the future. “The main point of our work is to give people in our coastal towns and cities more information to work with as they decide how to deal with the growing problem of sea-level rise,” said Overpeck.